I think a little cheese biscuit with a drink when ones’ guests arrive is a perfect way to begin any party. The Moreton Club has done these tiny biscuits for years and whilst I believe that the recipe is available I do not know anybody who actually has it. I am enormously proud of this recipe because it is the result of a lot of hard work and much experimentation. I think my recipe is a little better than the Moreton Club’s. Lately it is my most requested recipe, which does say something! This recipe has the added advantage of having equal quantities of butter, flour and cheese which makes it very easy to remember, and very easy to make in smaller or larger quantities. When I began experimenting with these biscuits, the flour was all plain flour. Then it became plain flour with a little rice flour added, then plain flour with a little ground rice. Now I make them with equal quantities of plain flour and ground rice. This gives the biscuits a very satisfying crunch. Sift together the plain flour, cayenne pepper and ground rice or rice flour. Cut butter into small cubes and place in the bowl of a food processor. Add sifted flour/s and cayenne and the finely grated Parmesan. Process until the mixture forms a ball around the shaft of the food processor. Remove biscuit dough from food processor and wrap in plastic film. Refrigerate dough for 1 hour. Grease a baking sheet or baking tray with butter and, using hands, roll biscuit dough into balls approximately 1 cm in diameter. Place on the baking tray and press balls with a fork to flatten and decorate. Bake for 10 – 15 minutes, or until the biscuits are lightly coloured. As soon as you can smell the cheese in the biscuits they are almost done. Cool on a wire rack until completely cold, then store in an airtight container into which some kitchen paper has been placed. If biscuits are not needed for a week or two, seal the airtight container with tape. 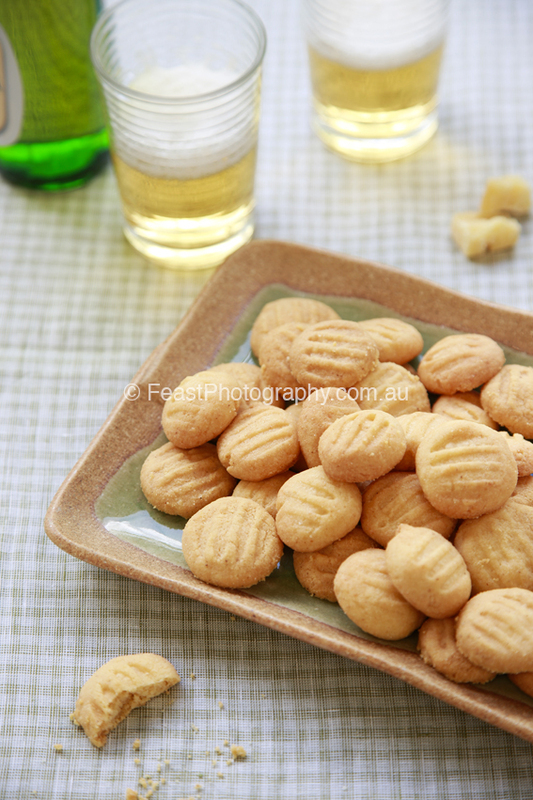 To serve, reheat at very low temperature on baking sheet until biscuits are warm but not hot.